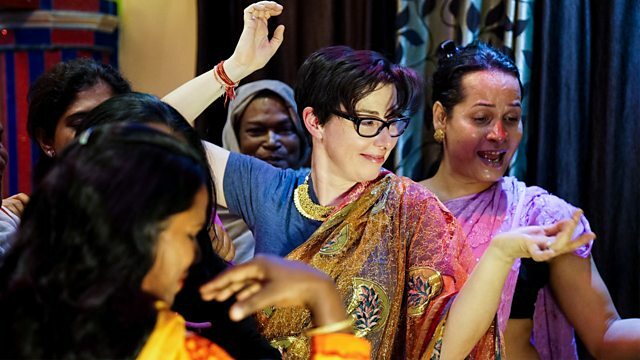 Sue Perkins undertakes an epic journey along the Ganges. Sue is on the final stretch of the river, where a new India is being built right before her very eyes. Sue's first stop is the ancient city of Patna, capital of Bihar state, along the banks of the Ganges. It was once the centre of the British Empire's lucrative opium trade. Now that the imperial drug lords have left, Patna produces something far more intoxicating - education. Sue visits the Women's Industrial Training College, a girls-only college teaching young women to be engineers. She hangs out with some of the students, and they tell her of their dreams to build bridges and drive trains all over the world. Leaving the smoggy streets of Patna, Sue heads out into the countryside, where millions of small farms are watered by the Ganges and its tributaries. India is a nation of small famers, and Bihar state is one of its most productive regions. Sue heads to Daveshpura, also known as the miracle village, to meet a farmer called Mr Kumar. South of Patna, the Ganges splits in two. Part of the river flows on through Bangladesh to the sea, but Sue follows the Indian branch, called the Hooghly, onward to the great city of Kolkata. This is Sue's second visit to the city. One of the highlights from Sue's last trip was meeting Geeta from the Hope Foundation and some of the street kids of Kolkata - one in particular that stayed with her was the rather naughty nine-year-old Rakhi. Sue catches up her to see how her life has changed since. All of life in Kolkata is crammed into its teeming streets, and Sue meets one of its most extraordinary communities - the Hijra. She joins them as they have been invited to bless a newborn baby. Sue leaves the glorious chaos of Kolkata and travels south to where the Ganges meets the sea, and she heads out with the forest department's tiger patrol to see what it takes to protect one of the world's most endangered cats - the Bengal tiger - in a country with so many people. Sue also stays on Bali Island, where people have to live and work right next door to a thriving wild tiger population. It feels like a million miles from the chaos of Kolkata. Life here is slow, and people farm, collect honey in the forest and fish in the tidal creeks that ebb and flow through the mangroves. It looks beautiful, but there is a catch - tigers hide in the thick mangroves and leap on to the boats. Sue joins Kolpana and husband Dinanda on fishing trip and hears their stories of lucky escapes. But Sue also learns that there are more tiger attacks here than anywhere else in India. No-one knows exactly how many people are killed by tigers each year, because many of the deaths go unreported. But there's at least one fatal tiger attack here every week. Yet remarkably, the people of this region want the tigers to thrive, as they are the guardians of the forest. Sue's final destination is Saga Island, in the mouth of the river. Sue is here from dusk till dawn on the biggest night of the week, where two million people are expected to bathe in the Ganges as the sun comes up. Sue meets Naga Babas, or naked holy men, along with pilgrims who have travelled from all corners of India to be here on this auspicious day. Swept along in a tide of humanity, Sue heads towards the beach and the sea. Under a rising sun on a brand new day, Sue shares with two million people an extraordinary communion with an immortal goddess and an amazing river.